Quirky and bold. Urban and edgy. The newly reimagined Hotel Versey is an eclectic boutique hotel in the Lincoln Park and Lakeview neighborhoods. Housed in a historic building - originally The Diversey Arms - that welcomed jazz, soul and rock 'n' roll artists through the past century, our new lifestyle hotel features a hip, modern decor with local art in dramatic spaces. The new Hotel Versey pays tribute to the original name and v-shaped structure at the Clark and Diversey Corridor. Layered historic accents mix with a playful personality that embrace the city's culture and musical heritage. 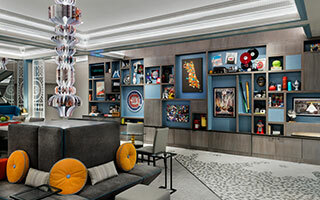 Connected to the surrounding community, our Chicago hotel is a unique destination for fun-loving families, students, baseball fans and music lovers from around the world who want to stay as a local.